Participate in the meeting at The Mother Church in Boston, MA or watch a live webcast online. A replay will be available within 24 hours of the conclusion of the meeting and will be available for one year. Let the Bible and the Christian Science textbook preach the gospel which heals the sick and enlightens the people’s sense of Christian Science. This ministry, reaching the physical, moral, and spiritual needs of humanity, will, in the name of Almighty God, speak the truth that to-day, as in olden time, is found able to heal both sin and disease. All events are available via live video webcast. Replays will be available within 24 hours of the conclusion of each event and will be available for one year. Church: We find we are able to give more when we start by loving what we've been given. 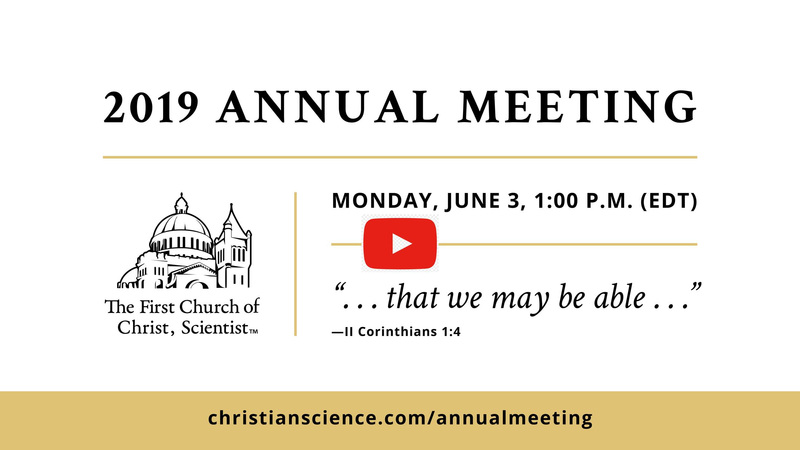 To participate, go to christianscience.com/annualmeeting.